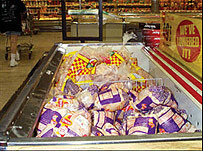 Uneven Frozen food temperatures in freezer units could be a costly mistake and more importantly dangerous to the unexpecting consumer. Thermal imaging provides a more accurate temperature signature compared to traditional thermometer methods allowing you to be proactive in food storage practices and minimize your spoiled food risks and costs. 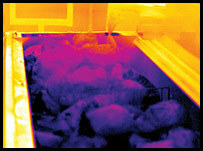 The images above shows thawed poultry products which had to be thrown out due to an incorrect freezer temperature.